Fitness experts love bodyweight training, it’s true! On this episode of the Runtastic Fitness Channel, I am joined by running expert and personal trainer Sascha Wingenfeld and fitness model and athletic coach Sven Friedrich. We’re talking about bodyweight training and which exercises are our all-time favorites. As trainers and coaches who love to work out, we find that bodyweight training is extremely effective but also really convenient. 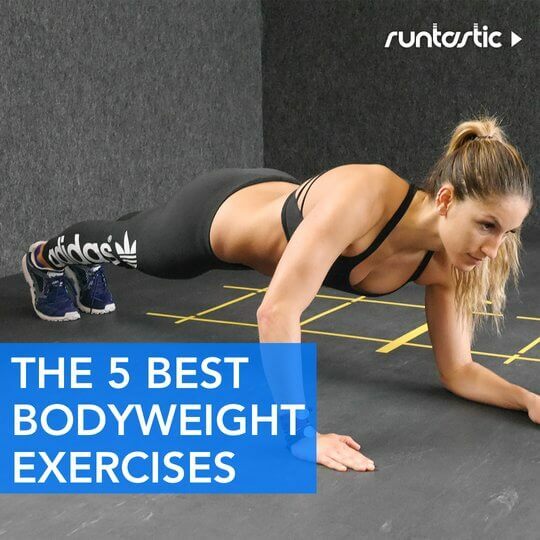 Whether we find ourselves in a hotel without a gym or only have 15-20 minutes to squeeze in a quick workout – bodyweight training is the answer. Plus, it’s also great to train clients with bodyweight training so that they can become aware of all the possibilities. If you have been watching the Runtastic Fitness Channel for a while, you know I am a huge fan of planks and burpees. There are so many different variations you can do of both exercises that you’re not likely to get bored. Wherever you have enough room to lay down, you can do planks and burpees. Check out the full video to discover which exercises are our top trainer picks! Do you have a bodyweight training exercise that is your favorite? Tell me about it in the comments section below.